The Alsatian Dog comes from Germany and was bred originally for herding and guarding sheep. It's origins can be dated back to the 1700's. The Alsatian Dog is also known by the other names of the German Shepherd Dog and the Deutscher Schaferhund. The advent of the two World Wars influenced the history of this dog. The association with Germany was unpopular following the wars and the breed was therefore given the name of the Alsatian Wolf Dog after the German-French border area of Alsace-Lorraine. The term 'Wolf Dog' was then dropped as it was believed that this would also prove to be unpopular. Finally, in 1977, the breed name was changed back to the German Shepherd Dog. This dog is classified as one of the Herding Dog Group which we go on to describe in detail in the section at the bottom of this page. The Alsatian Dog was first Registered by the AKC (American Kennel Club) in 1908. Dog Name Facts and Dog Names:The word Alsatian is often mis-spelt as Alsation. The Alsatian Dog's coat is normally a shade of solid black, grey, tan, gold and white. The coat is normally medium, straight and hard. Should any Alsatian dog or puppies health problems occur it is advisable to raise any issuess you may have with a Veterinary Surgeon. The Alsatian Dog requires weekly care and grooming. Grooming consists of not only brushing out the coat and bathing but also giving attention to the eyes, teeth, ears, feet and nails. A regular routine helps to ensure that any potential health problems are identified as quickly as possible, especially important in puppies and older Alsatian Dogs. The life expectancy for the Alsation breed is 12 – 14 years. Age comparisons between dogs and people are always a matter of debate - we hope that the following information clarifies the situation. After the 1st of life, a dog is equivalent to 16 human years. After 2 years, they are equivalent to a 24 year old, at 3 years a 30 year old, and each year after, add 5 human years to determine a dog's equivalent age. The Pictures reflect the Size of Adults - not Children and Puppies! 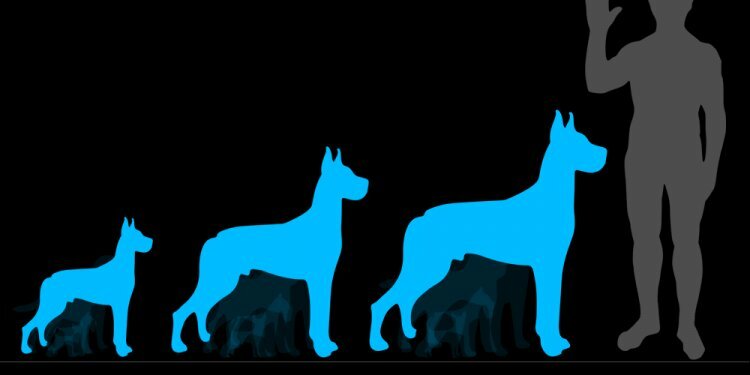 The pictures above allow for a useful comparison of sizes providing an accurate portrait of the size of an average Alsatian Dog - essential information but unique to this site. The size of puppys are considerably smaller and the full grown size of the canine can easily be forgotten when confronted with cute puppies! The slogan "A dog isn't just for Christmas - it's for life!" came about as a result of well meaning people buying puppies at the Xmas, unaware of the puppy's growth rate. The pictures provided make it very clear exactly how big puppies will grow and whether they will suit the living conditions of the family. Dogs in the Herding Group ( sometimes referred to as the Pastoral Group ) include the Alsatian, were developed to perform a variety of tasks relating mainly to the herding of livestock. The types of livestock that these dogs are associated with are quite diverse and include sheep, cattle, reindeer and any other cloven footed animals. The Herding groups of dogs are eminently suited to these pastoral tasks as many of the breeds have a weatherproof double coat to protect them from the elements when working in severe weather conditions. Their natural abilities have been fully recognised and the initial livestock herding function have been extended to include police work and Search & Rescue amongst other duties.